First thing to do is measure the conductors, stranding and diameter. 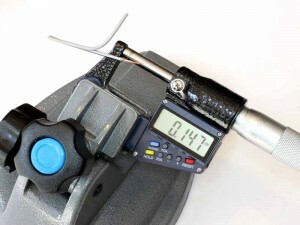 There are 14 strands and several measurements fall just below 0.15mm diameter. This is probably nominal 0.15mm with new drawing dies which are a little undersize. RF flows around the outer surface of the conductor, even for stranded conductors like this. 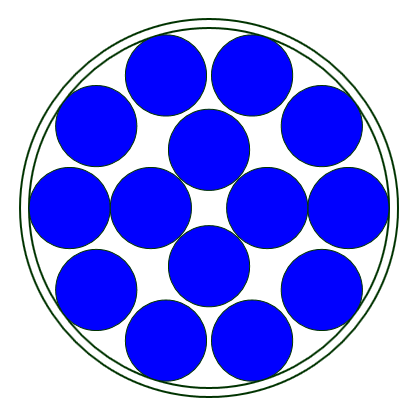 The best packing of 14 strands is a layer of 10 over a core of 4, in which case the smallest containing circle is 0.665mm. The effective RF resistance is probably similar to a round conductor of just a little less, lets use 0.65mm (22AWG). The two conductors are spaced 1.8mm centre to centre. The cable is figure 8 PVC insulated, gray in colour with a black strip to mark polarity. Experience is that velocity factor for this type of construction is typically quite low, 70% is probably a good guess. So, lets plug those figures into TWLLC. Zo is around 140Ω, the ham folk-lore that such cables have a Zo close to 70Ω or like and very suitable for a half wave dipole is just nonsense… there are likely to be standing waves in most applications and that has impedance matching and loss implications. Speaking of loss, matched line copper loss at 14MHz is about 0.32dB/100m which is not too bad at all, and even with mismatch, the copper loss of say a wavelength of such line with a load of say 60+j0Ω is 0.65dB, not too bad at all. The problem is that flexible PVC is not a good dielectric, and highly variable dependent on the fillers, pigments and plasticisers used. At 14MHz, the dielectric loss could be as much again or more for an overall loss under the scenario above around 1.3dB… which might not be too bad for some users. The picture could be considerably worse at 28MHz. Dielectric loss is proportional to frequency, so once it becomes significant, total loss increases more quickly than when conductor loss dominates. Operation without an ATU may prevent obtaing rated transmitter output power, so a potential further degradation in station performance. I did test a sample of Jaycar WB1702 speaker cable some time ago, results are reported at Speaker cable as RF transmission line. In that case, characterisation included capturing the dielectric loss, and it was quite poor above 10MHz, not only are the conductors small but dielectric loss becomes significant. I cannot comment on the correspondent’s sample in that respect, as I said it was too short to do fuller evaluation. I do make the observation that QRP users tend to be more accepting of low efficiency antenna systems. Or perhaps it is just that QRO users cannot afford inefficient systems as losses are more likely to damage system components and more care is necessary.